This cycle focuses on the dharmakaya Amitayus, sambhogakaya Ngensong Dongtruk (a form of Avalokiteshvara), and the nirmanakaya Padmasambhava together with the twelve emanations of Guru Rinpoche. The disciples, including the Lord Trisong Detsen, the subject Vairotsana and the friend Yeshe Tsogyal, reflected and thought about what Guru Rinpoche had said. They saw that it was true, and that there was not any practice for removing obstacles greater than praying to the lama. Then they thought, “Our root teacher, who took birth intentionally in the form of a vajra master, is Guru Rinpoche. He is the one who has granted us empowerments and teachings. He himself has said that just as the deity who has a special karmic connection with Tibet is Avalokiteshvara, he is the master especially connected with Tibet. Out of compassion and as a result of aspiration prayers made in the past, he took birth deliberately to train beings in this land. So for us the lama is definitely Guru Rinpoche. And therefore we need a special method for praying to him.” With this in mind, they requested Guru Rinpoche to teach them such a practice. Dharmakaya Amitabha, to you we pray! Sambhogakaya, Great Compassionate One, to you we pray! When he had granted this previously unknown prayer, the disciples all thanked him, but then they said, “We suspect that there is also a method of accomplishment (sadhana) related to this, complete with activity practices. Please could you teach this not only for us disciples here now, but especially for beings in the future who have devotion to Guru Rinpoche.” With this, they offered him their bodies, wealth and possessions and requested him to teach this practice. Then at that very moment, Guru Rinpoche transformed and assumed the form of Nangsi Zilnön, ‘The Master Prevailing Over All that Appears and Exists’, the chief of the mandala, surrounded by the other deities such as Tsokyé Dorjé (‘Lake-born Vajra’), Padmasambhava and all his various manifestations. Above his head was the sambhogakaya four-armed Avalokiteshvara, and then the dharmakaya Amitabha. All around him were the twelve emanations of Guru Rinpoche, and at the four gates of the mandala were the four dakas together with their consorts. He emanated this whole mandala directly and granted the disciples the empowerment. And the door to the lower realms will be closed forever. If it proves otherwise, I Padma, have deceived the beings of the future. When he made this proclamation, Yeshe Tsogyal felt her devotion increase tremendously. With her unfailing memory she was able to recall every word that Guru Rinpoche spoke on this occasion. She asked Guru Rinpoche whether it would be best to spread these teachings straight away or to keep them for the sake of future generations. In reply, the Guru said, “Just now this is a fortunate time and I Padma am here teaching in Tibet. Now is the time for practising these teachings on your own, not for spreading them widely.” Then he prophesied the lives of Chokgyur Lingpa and Jamyang Khyentse, and said that at that time in Tibet other teachings would lose their power on account of samaya breakers, and that that would be the time to spread these teachings. He advised them in precise detail about the exact location where these teachings should be concealed and exactly how they should be hidden. Yeshe Tsogyal wrote everything down on a white scroll with her own rakta in the secret dakini script. Then before he left for the land of the rakshasas, Guru Rinpoche examined the terma site of Danyi Khala Rongo and made sure there would be no obstacles. It was finally concealed there twelve years after he departed from Tibet. Then centuries later Chokgyur Lingpa discovered this terma at the age of about twenty-six or twenty-seven, and deciphered it together with Jamyang Khyentse Wangpo. Shechen Gyaltsap IV and Rinchen Dargye, A Practice of Padmasambhava: Essential Instructions on the Path to Awakening. Ithaca: Snow Lion Publications, 2011. 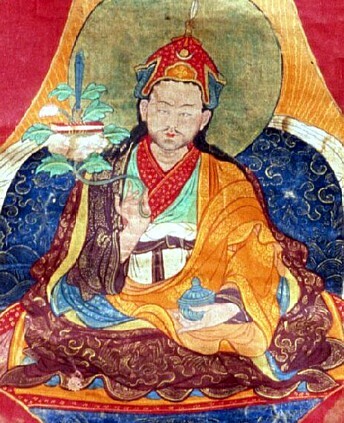 Padmasambhava Guru Rinpoche, Chokgyur Lingpa. Dispeller of Obstacles: The Heart Practice of Padmasambhava. Rangjung Yeshe Publications, 2014. This page was last edited on 12 June 2017, at 07:18.